Eight years in the making, Cleaning Her House is the result of a ton of research and personal experience about hoarding. Because at present there is no easy cure for hoarding, I’ve centered my tale around the hoarder’s daughter. She takes on a difficult family duty and during the process discovers secrets about her family that cause her to view her life with a new lens. 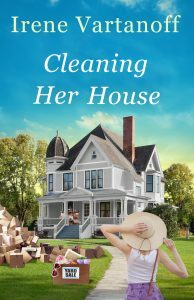 College professor Elinor Goggin hasn’t returned to spend a summer in Coopersville, West Virginia, in twenty-five years, but this July she’s trying to help her hospitalized mother by decluttering the hoarded family home so the doctor will let her mom out of rehab. Yet her mom, always critical of her youngest child, is furious that Elinor is even touching her overflowing collection of random possessions. When county inspector Race Ericson threatens a court summons if the hoard isn’t massively reduced in a hurry, Elinor faces a dilemma. Surrender to her mother’s insistence that she do nothing, obey her bossy elder sister’s edict that she sort carefully through every single pile (her sister conned her into taking on the job), or satisfy Race’s demand that she ruthlessly clear out the junk? Elinor has never been shy with attractive men. Satisfying Race would be a pleasure. But when family secrets come to light and surprises turn up on her doorstep, Elinor’s task gets very complicated, forcing her to reevaluate long-held beliefs about her family—and her own life choices.